If you're preparing future meals for just yourself, it may be difficult to determine how much you should attempt to freeze and heat up. With FoodSaver® Portion Pouch Rolls, you can store a single serving of the meat and vegetables for your meal to be pulled out of the freezer when you need it. They're like fresher, healthier TV dinners! For those cautious about overeating or looking to decrease the size of their waistline, portioning your meals ahead of time can be incredibly beneficial, as you can't eat what's still frozen. Since you'll vacuum the extra air out before freezing the pouches, it'll be easy to stack multiple meals for future dates in your freezer. People who travel a lot are well aware of how tough it can be to fit all of their travel necessities into a suitcase. However, vacuum sealing what you pack in your luggage is a great way to make more out of your limited luggage space. Keep your socks and accessories together in small portioned rolls. This also protects your clothes from any potential spills or leaks from your toiletries. Once you get to your destination, though, take anything you don't want wrinkled out and hang it to limit the amount of time it spends compressed! Vacuum sealing is very similar to laminating, though most people don't have a laminator handy in their homes! If you're preparing your food ahead of time, there's a good chance that you're an avid cook and have a plethora of recipes at your disposal. If you find that most of your recipe cards are torn up and stained by food, consider vacuum sealing them with small portion rolls to protect them. This way, any food that spills on them can be wiped right off so you won't have to try to decipher what's under that teriyaki sauce next time you decide to use the recipe. Keep some cheap ice packs in your freezer by wetting sponges and vacuum sealing them so they take up as little space as possible. This allows you to store a lot of them in the freezer, but also makes it easy to put the flattened ice packs in lunch boxes, without worrying that they'll leak all over yours or your children's lunches since they're sealed. 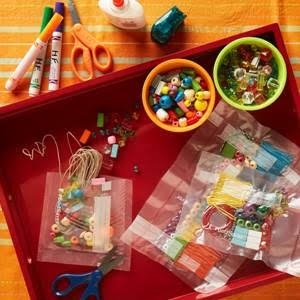 Anyone who enjoys arts and crafts knows how difficult it can be to keep all of your supplies together. This is another activity that can be made much easier with FoodSaver® Portion Pouch Vacuum Seal Rolls. Not only do your supplies stay neat and organized, but using your FoodSaver® System also allows your odds and ends to take up less space.